Holiday Season, the time of year we search for that special gift for the people we care for. 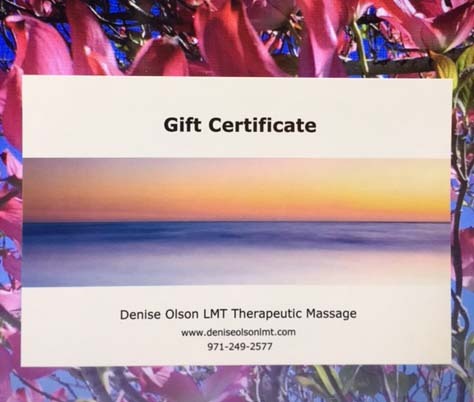 This year give the gift that says, “I care how you feel” by purchasing a gift certificate for Therapeutic Massage or CranioSacral therapy. Right now by purchasing four or more gift certificate package, you will save $10 per hour. Give your family and friends the gift that promotes better health and save one for you to help with those holiday stresses and aches. 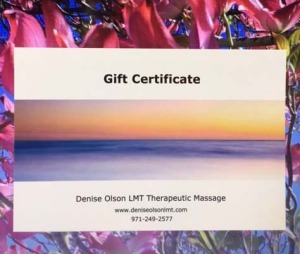 For session times, information, and how you can order your Gift Certificates, email me denise@deniseolsonlmt.com.